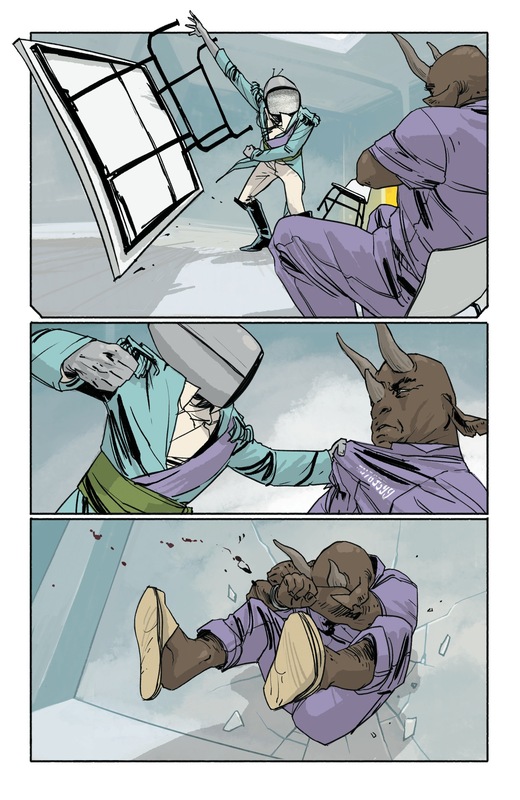 I’m a bit late on this review–Saga has been winning awards consistently since 2012 and to say anything other than a glowing review almost feels sacrilegious. Luckily, this review is going to be pretty glowing. 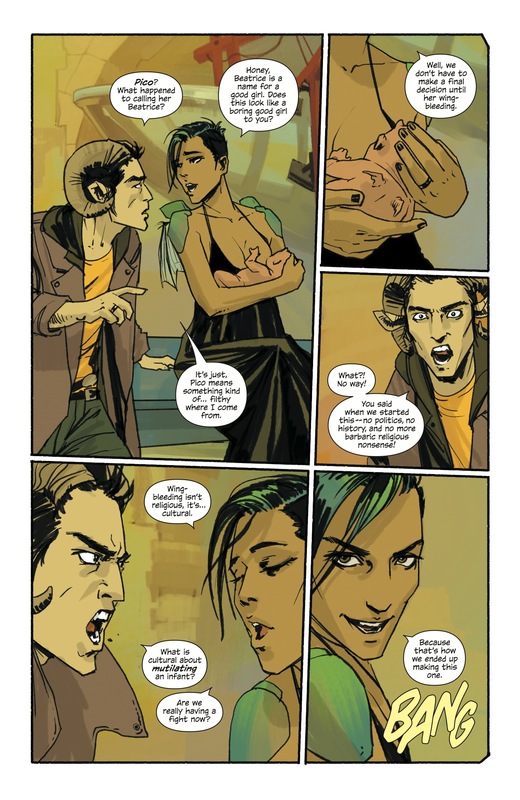 Saga is best described as Star Wars meets Romeo and Juliet (with a much less despicable set of star-crossed lovers). It’s a space opera, it’s full-blown fantasy, it’s sci-fi and it’s full of any emotion you could name. There’s drama, violence, anger, lust, heartbreak, fear, conflict, happiness, and of course, love. The story revolves around Alana and Marco, two lovers on either side of a never-ending galactic war. The narrator is none other than their newborn daughter Hazel, a hybrid of the two species and an abomination to governments on both sides of the conflict. The story opens with Hazel’s birth (in an understated yet realistic birth scene) and quickly takes off from there as the family goes on the run from bounty hunters trying to exterminate Hazel and the peace she stands for. The cultures of Alana and Marco are different but their love feels real and full of struggles that are timeless and familiar to those not being chased from planet to planet. Image Comics stakes its brand on independence, artist creative control, and a break from the money-grabbing of other big publishers. The marriage of acclaimed writer Brian Vaughan and masterful artist Fiona Staples in this bold, galactic-sized love story is hugely successful both on a personal and financial level and Image should be proud of themselves. Vaughan’s dialog is full of wit, vigor, depth, and reality. It’s at times funny, at times sad, at times immensely touching. His storytelling is emotional and perfectly paced (something hard to find in the sector of fast-paced, erratic storytelling that is comics). Staples’ artwork is where Saga really comes to life, however. Her storytelling choices and panel division is nothing earth-shatteringly new, but that isn’t where her proficiency lies anyway. Her real art is the faces of her characters and the emotion therein. There are recurring themes throughout the story that one would expect of a wartime love story: pacifism and the struggle there, the cost of killing and surviving, the wartime economy and ethics of a nonstop conflict fought by government officials removed from their people. There are also more understated themes in Saga, however. Breastfeeding as a normalized, nonsexual act caused a fair amount of controversy when Staples’ first cover featured Hazel breastfeeding and some comic stores refused to stock it. (There is more than one article’s worth of content to examine when the comic industry, full of violence against and objectification of women won’t show a woman breastfeeding her child but that’s for another day.) In fact, Alana very casually breastfeeds Hazel through conflict and flight without question or apology or fanfare. Discrimination (and what it means when your government gets to choose who is an abomination), the ethics of military contractors and the complacency of “just doing your job” and even the ethics of circumcision are brought into the spotlight. Saga is a touching narrative about the cost of war and the struggle for peace and love. That sounds cheesy (and it just might be) but Vaughan and Staples do it well. 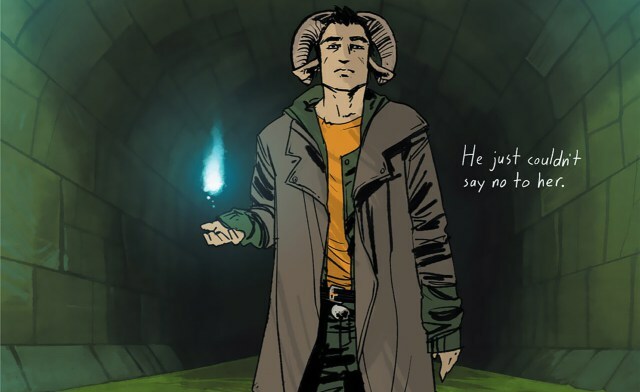 Expect reviews of volume 2 and 3 as soon as possible–Saga is too good of a read to put off. Previous Post Escher Girl Challenge: Let’s try it ourselves! I’ve never been big on comic style or dramatic books, but this one looks very interesting. I am more a horror, blood and gore kinda girl. Where would I find this book at? I bought it online used for like 4 dollars. Normally I would say check the university’s comic book section but sadly they seem to be missing it. I’m going to be putting a request in for it and the next couple volumes but in the meantime you can borrow mine? And I totally hear you, superheroes aren’t my first choice either, believe it or not. Pingback: What’s on your pull list?